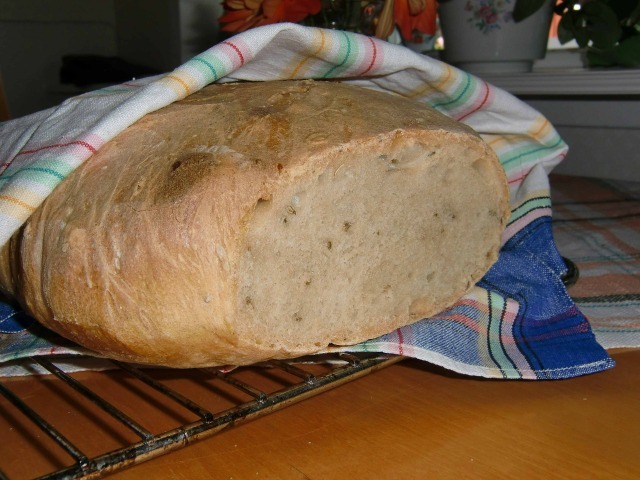 Because home made bread doesn’t have preservatives in it, keeping it fresh can be a bit of a struggle. If you don’t have an army of kids on hand to devour it you’ll want to be thinking about the best ways on how to store homemade bread to keep it fresh for as long as possible. The most efficient way to store your bread and keep it fresh is going to be to freeze it. I often do this and find that although it’s not quite as great as just out of the oven bread, it’s a good compromise which means I’m never without my homemade bread! Always slice it if you can before freezing. Whatever you use to keep your bread in, always make sure it’s not in direct sunlight and isn’t too warm. If you do you’ll create moisture around the bread which then will help to make it go mouldy more quickly. I think finding the best storage area possible is sometimes more important than just what you put it in. If you are looking to just keep it as good as possible without freezing, you’ll want something to wrap your bread in to stop it getting dry. I’ve tried a lot of things in the past, from just reusing regular bread bags from store bought bread to bags that I’ve bought specifically for the purpose, to bread bins. Recycling bread bags work for a while and are a good budget option, but if you don’t buy much bread from the supermarket you’ll find this one a bit trickier! You have to also remember to clean out the bag as best as you can as well. If you leave crumbs in there they’ll go mouldy quickly and pass it on to your fresh bread – not good. You can, of course, by some specific bread storage bags like this one which is basically a plastic inner inside a nice cotton bag. You’ll need to be aware of keeping it free from crumbs for the same reason as recycling the shop bread bags, but other than that I found that it worked quite well. Some people find it doesn’t work at all though, your mileage may vary! As I said above, I think what can make it ineffective is where you keep your bread bag – if it’s a hot place it might make the bread too hot inside and of course it will be a breeding ground for mould. If you’re trying to keep plastic down in your life then a cotton bag might also do the trick for you, or simply get a clean tea towel and wrap it in that. I find that plastic bread bags make the crusts go softer quicker, where the fabric bags keep the crustiness a bit longer. Bread bins are a good idea too and can keep all your bread contained in a nice area on your work surface. I tend to combine them with a more close covering like a tea towel or a bread bag so that air doesn’t dry them out especially once cut. My last tip isn’t quite going to keep it stored longer, but I think it’s a worthwhile thing to bear in mind if you want your bread to be eaten. Slice it. I find that if presented with an uncut loaf of bread it’s not as easy for the family browsing my kitchen to think of it as a nice and easy bit of food to eat! But, if I’ve taken the time to slice the bread and it’s easily made into toast or a sandwich, it will be eaten more readily and not be left to go stale. I always use a bread slicer to get even slices and the most out of a loaf. At last a sensible post for storing home made bread. We run a B&B so the bread rarely gets to go stale/mouldy, but does at times no matter how we store it. Will certainly try the tea towel method.